I had a nice night at a very special movie theater. 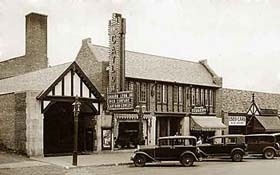 The 76 year-old Catlow Theater is a beautiful historic building on Main St. in Barrington, IL, a prosperous suburb of Chicago. Unfortunately, this 700 seat theatre has been struggling financially. As a second run theatre charging just $4 a ticket this gem has had a tough go the last several years. Just a few miles away a 30 screen multiplex has siphoned off most of the customer base. Still this gem designed in the 1920s remains largely unchanged from it's original construction. Compare 2002 view left with 1930s view right. 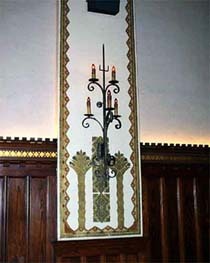 The theater has many fine decorative details designed by the famous sculptor and painter Alfonso Iannelli. I've been to this theater a couple of times and I have to work hard to stay focused on the movie as marketing plans for this theater run through my mind. Grown Up Films - "My Big Fat Greek Wedding" was a huge hit for this theater. It played for 19 straight weeks! Focusing on adults over 21 will distinguish the movie going experience at the Catlow. In a nod to the movie going experience of days past, show cartoons and even old newsreals before the screenings. Avoid pre show advertising. Staying away from teen focused "blockbusters" and offering interesting films both mainstream and independent will draw grown up patrons tired of the multiplex crush of teenagers and four dollar candybars. 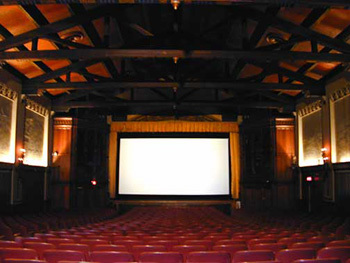 Go Luxury - This gem of a theater is located in a very affluent community that loves this theater. The area multiplex theaters are over run with teenagers and huge crowds. I think an excellent 21+ movie going experience can be crafted that would carry a $15-$20 ticket price. A comfortable seat, a free bag of popcorn and a soft drink, a cartoon that makes you smile, a good movie, the availability of food and drink and a ride home. Sounds like a great date night. Doesn't it. 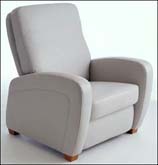 Reduce Capacity - Replace the old 700 seats with perhaps 250 luxury leather reclining seats. Comfortable seats with plenty of legroom. Tables between seats for foodservice. Event Space - Surely a space with projection facilities, luxury seats, food service and a cool bus(see transportation below) would be a great place for corporate meetings and training events. Rental revenue could be significant. 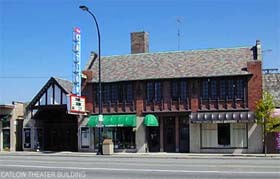 Food Service - The theater owners operate a sandwich shop adjacent to the theater lobby. 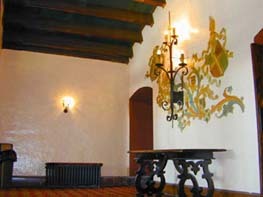 The lobby space is used for restaurant seating during the day. At show time patrons may take their sandwiches into the theatre. I would close the retail shop and refocus the foodservice facilities to provide food and beverage service for the theater. A simple dinner menu of high quality food with "seat" service would be significant to the whole experience. Free popcorn and soft drinks would add to the movie-going experience. Transportation - Parking is in short supply for this theater. A grocery store parking lot provides needed overflow parking. I would craft two elements to add to the theater experience. First, valet parking and a red carpet to make the arrival process more like attending a movie premiere. Hire photographers to play paparazzi snapping pictures as patrons arrive. Award the best-dressed patron an award. This is a time to dress like a star to be seen. 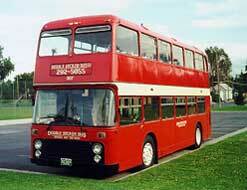 Second, lease or purchase an old refurbished double-decker bus. Establish bus routes through the community with stops at set locations where parking is plentiful. (i.e. office buildings with idle parking lots in the evenings, etc.) On senior evenings plan bus service to and from local retirement communities. Seniors like movies but many do not want to drive after dark. Swing by a hotel or two. Craft the bus ride into the whole experience. Have ushers to seat you, popcorn for the ride, movie trivia games, show tunes on the sound system, etc. Serve ice cream bars on the way home. Make it easy, fun and memorable. Partner with Area Hotels - Create dinner and a movie packages with area hotels. Use the bus for service from and to the hotel. Business travelers may want an easy way to fill an evening. Get on the bus, see a movie, have dinner and take the bus back is easy and fun. Traveling tour bus groups could be accommodated. "Movie Cats" Friends of the Catlow - Start a non-profit group to support the theater. Offer memberships that include special screenings (premieres), discounted movie passes. 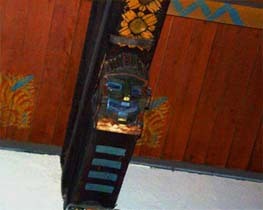 Raise money for the upkeep of the historic elements of the facility. Host fundraisers for local charities. Join with other preservation groups supporting other historic theaters. It all builds cache for the movie going experience. Some fun creative ideas can save this theater and make a cultural impact on the surrounding communities. In a homogenized multiplex world fewer and fewer authentically differentiated experiences exist. It's the small innovative experience crafters that prevail. Just look at the movie that provided a saving influx of revenue for the Catlow. My Big Fat Greek Wedding came out of nowhere and wildly exceeded all expectations. The Catlow could be just the little theater that wildly exceeds all expectations. Owners that understand that the Catlow is in the entertainment experience business is the key. If they continue to be in the movie exhibition business they will lose. Others simply have technical advantage. They don't have a 76 year old gem of a theatre. The great building, like leather seats, a bus and food service, is an element to crafting the entertainment experience. Skillfully using all the elements together can create magic. Oh, and don't forget to sell the soundtrack CDs in the lobby after the show. Catlow photos copyright 1995-2003 Boloney's, Inc. I enjoyed reading your ideas about the Catlow. However, I must believe you have never eaten at Baloney's suggestng to change the food service. I like you have several ideas for the Catlow that I believe would increase business ten fold. This is great that we are able to get the mortgage loans moreover, this opens completely new opportunities.